Foreign investors continue to like India but not quite as much as they did in March. After selling about 13,000 cr. worth equities in Jan and Feb, Foreign Portfolio Investors (FPIs) bought over 21,000 cr. in March, following it up with 8,400 cr. in April. That was just equity- they’ve even bought debt of 7,800 cr. in the two months (though, to be fair, much of that was because of an increase in government debt limits in April). Despite all of this we have an FPI net of over Rs. 24,000 cr. (until May). 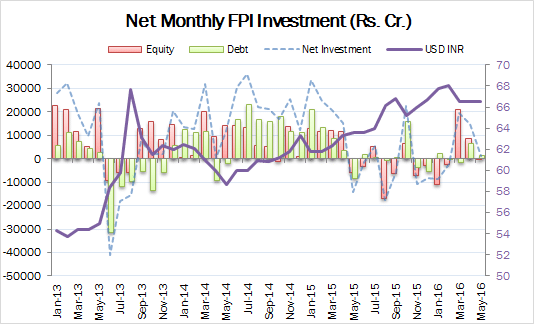 In May, while FPIs have been selling equities (just the first 9 days) they’ve been buying into debt which keeps their net investments still positive. This is remarkable as a recovery in investment in India after a shaky first two months of 2016. However this seems to be a one-way street so far – we haven’t seen a “negative’ year since 2008. This is very very rare; and while the trends seem strongly in favour of India even now, we should expect a year or two of heavy negativity. Remember that the USD has gone from Rs. 40 in 2007 to Rs. 66 now, and that hurts the early investments in India – it will only be a more stable currency that will attract more flows. Indian markets have largely been about flows from abroad, rather than domestic money hitting the market. We should watch carefully for that metric to change – however, in the near term, we can attribute our broad market gains and losses to the fancies of foreign portfolio investors. May’s first 10 days show signs of a small decline in equity investment, but let’s hope they don’t sell in May and go away.